John had miraculously walked ten feet with a fractured pelvis, grabbed onto the tractor, climbed three steps, lifting each leg with his hands, put the running tractor into automatic gear and driven to the cow shed. By the time he reached Yvonne his body was in shock. John Murdoch, 46 years, stands in his silent barn. Behind him towers a 14ft high stack of straw bales. “This is eerie,” he whispers. 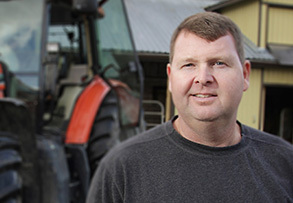 John is reliving the moment on February 4, 2013 when 1,000 pounds of hay collapsed on top of him, pinning him to the ground with a fractured pelvis, cracked vertebras, broken ribs and a partially collapsed lung. Alone and injured in the barn, surrounded by farm fields stretching to a distant Maple Ridge, calling for help was useless. A twelve minute ambulance drive delivered John to RCH where Dr. Michelle Goecke, Lead Trauma Physician and her team where waiting to receive him. Twenty four hours after the accident John was in surgery in the expert care of Dr. Trevor Stone, an Orthopaedic Surgeon at RCH. During surgery, a plate was applied across the two pubic bones to stabilise the fracture. “We are the only site in Fraser Health that would routinely look after this injury. Most patients with pelvic fractures are transferred to RCH for care,” says Stone. The spine injury, although crucial in location, was amenable to non-operative treatment. While recovering, John was placed in a Jewett Extension Brace. This extends the spine and corrects or offloads the deformity of crushed vertebrae. The brace kept John out of flexion for at least twelve weeks, so the vertebrae could gradually heal. After 11 days of care, watchful monitoring and physiotherapy at RCH, John went home in a wheelchair. “I am a very determined person. Whatever exercise I was given, I doubled.” Today, 10 months later, John is working his farm again alongside his wife Yvonne. “My man of steel,” she chuckles playfully.